This one is the side/service entrance to the Neptune Theatre in downtown Halifax, Nova Scotia. 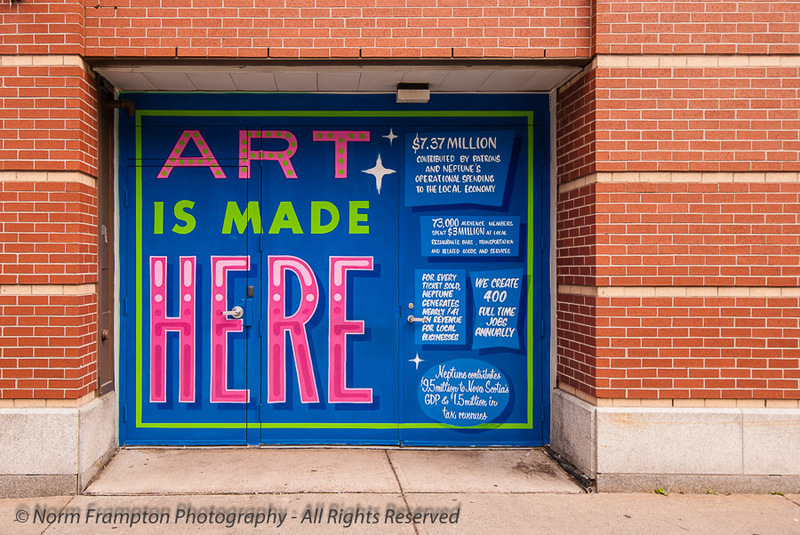 This entry was posted in Photography, Thursday Doors and tagged Art has value, Downtown Halifax, Live Theatre, Neptune Theatre, Nova Scotia, Photography, Thursday Doors. Bookmark the permalink. I love how you took a different turn with this week’s door! That is an awesome piece of art / message they have painted on those doors:) Love the colours! We meet here to share doors every Thursday through Saturday. Feel free to join us whenever you have a door post you’d like to share. Thanks Jane. I couldn’t walk past it without photographing. It certainly does jump out. Fixed it. The link to the post may have been a few characters too long, but mostly it was in the wrong field: It was in the 1st instead of 2nd. Norm–I had it in the second–I had no idea what was supposed to go in the first blank so left it empty. But, when I tried to send it, I got a message that I had to fill in all the blanks…so I put the URL in the first, as well. It must have erased it from the second blank. What is supposed to go in the first field? The 1st field is for the name of the person or their blog. Thanks, Norm. I’ll try to be less of a bother in future posts! I had to look close to see that it WAS a door! This is a great one, I love it! Thanks, glad you like it. Stay tuned I have a few other colourful ones left in the archives. You’re right. When you start to think about it those terms it really is something to think of the impact a place like this can have on so many lives. The door certainly adds interest to what looks like a fairly drab brick building! Norm, I really like your door this week. Well seen and captured. I did find an interesting door while on vacation in Astoria Oregon and had to capture it for your challenge. Great affirmative shout out to the many ways we create art! Their advertising/artwork is covering what I would guess are some extremely bland and ugly doors. Love it! Colourful, creative door, quite an effective way to advertise. I love all art, but theater is one of my favorite forms. A very interesting door. Theater is one of my favorites too. Have been enjoying your challenge for a while now via Janet and Manja Mexi’s posts so have leapt in myself. I used the link option and thought just my name would appear but somehow managed to stick the whole link in! sorry not sure what I did wrong there! and just for good measure in case it doesn’t work here is the link again! Welcome and thanks so much for joining us! I’ll take a look in the link-up tool later today and let you know what went wrong but should be able to fix it for you. Thank you! Was the first time to use it. I may have just input the wrong info in the wrong spot? Fixed it. Yes you had the data in the name and url fields inverted. Name goes in 1st field and the url (link to your post) goes in the 2nd. Thanks. Yeah those colours really stood out. It’s just too bad we didn’t have time to actually check out a show while we were there. All that and so colorful as well. Nicely spotted, Norm. A nice piece of art to hide what would otherwise be a rather drab door, I suspect. I love doors like that Norm. I think it’s important to remind people that these things (art, theater, music) don’t just happen. Bravo! A lot of arts funding has been cut in Canada in the last decade despite economic studies that show the very large multiplier effects of arts activities (theatre, music, visual arts, dance, video…you name it.) So this is extra advertising for Neptune Theatre on what looks to be a stage or delivery door as well as a political statement . Long live local theatre! Love the door. It is a great way to advertise themselves. Gets their point across, no doubt. I agree. The lettering really makes this door special. I love the wording on the door, Norm. Hard to miss that one.